Only a few minutes from the Malia Strip, the Newcastle studios in malia are the perfect place to relax. This family run hotel features 23 beautiful studios that offer some of the most amazing views of the coast. This hotel is appreciated by families that travel often with children as the rooms are spacious with private balconies and extra cots and/or cribs are provided at a nominal charge. All guestrooms come with a fully equipped kitchenette. The staff here are hospitable in true Cretan style. The hotel features an inviting swimming pool from which you can view the sunset and enjoy views of the mountains as well. The onsite snack bar takes care of your hunger pangs but serves nothing more than light bites. 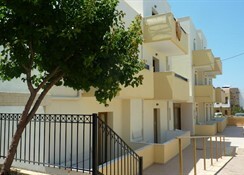 Newcastle Studios Malia are only a few minutes’ walk from the beach. There is a healthy combination of fine dining restaurants as well as bars, pubs and other lively outlets in the vicinity of the hotel. The Heraklion Airport is about 34km from the hotel. The hotel is not too far from the Malia Strip which has become the party hotspot in the Mediterranean after Ibiza. With plenty of beautiful beaches, Malia plays host to several all day and all night parties. Most of the big name DJs play here during the summer months and this beach resort is soon becoming the region’s party capital! 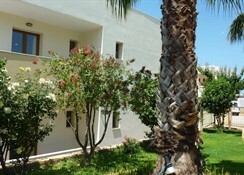 Newcastle Studios Malia is a family run establishment that offers 23 beautiful studios spread across three stories. Each studio can accommodate three adults or two adults and a child. The studios come with a fully equipped kitchen along with a dining table and private balconies. Amenities in the studios include air conditioning, flat screen TV, safe and hairdryer, with cots and ironing sets available upon request. 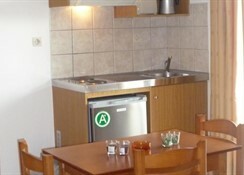 With the studios featuring a fully equipped kitchenette, there isn’t an onsite restaurant. However, the onsite snack bar offers light bites and finger food to take care of your hunger pangs between meals. There is a supermarket close to the hotel that allows you to shop for all the ingredients to prepare your meals. Newcastle Studios Malia feature an impressive outdoor pool from which you can see the sunset on one end and enjoy impeccable views of the mountains from the other. The courtyard is perfect to curl up with your favourite book or have some delicious cocktails – the onsite snack bar makes sure of this! There’s also pool and billiards tables for you to play a frame or two. Being so close to the Malia Strip, the hotel has in its vicinity a plethora of bars, pubs, restaurants and other avenues for exciting nightlife. At the beach, you can enjoy various water-sports.